In the process of surveying existing sports stopwatch apps, we have downloaded, tried and analyzed a lot of existing stopwatch apps from different global app stores. This is a stopwatch app overview with a certain minimum quality or app store ranking. It’s our own internal extended memory and scratch pad, if you will. The review is an ongoing effort and we are actively transitioning entries from our internal notes to this public page. So the following list may change, get more or less details added, or be reordered. We don’t know for sure. This is the stopwatch app overview for iPhone. The Android stopwatch app overview is coming soon. How to use the list: Click on the title, which is the app’s name or abbreviated name to get directly to the respective app store entry. If it’s not a completely free app, the price (in US-$ mostly for now) follows the app name — in round brackets, if it’s optional and the app thus a freemium app. Our own quick rating in square brackets follows to the very right of the title then. ++ An excellent tool for its intended application area. + Good, but not the top of the line. – Very simple (not in a good way) or poorly designed. Install if you must, or the app seems like all you ever need. — Really!?! Don’t bother. There are better options for sure. Or take an app programming class and implement a better version on your own in an hour or so. Notice that ratings may significantly depend on the seeming application scenario and may hence not be comparable. For example, a minimal stopwatch app with perfect execution may get a ++ rating, but be totally useless for sports timing. Therefore, we have tried to classify apps somewhat. This in particular is an ongoing effort. Minimal A minimalistic timing tool with its potentially rather limited purpose. Basic A close adaptation of a standard handheld stopwatch as an app. Beauty A basic stopwatch in a visually appealing (and not necessarily utilitarian) package. The eye-candy stopwatch. Timer Unlike a stopwatch, meant to indicate the end of a time period that is specified in advance. A stopwatch can be used as a not quite perfect timer, yet a timer is rarely good for typical stopwatch applications like sports. Most widely employed for athletic interval training these days. 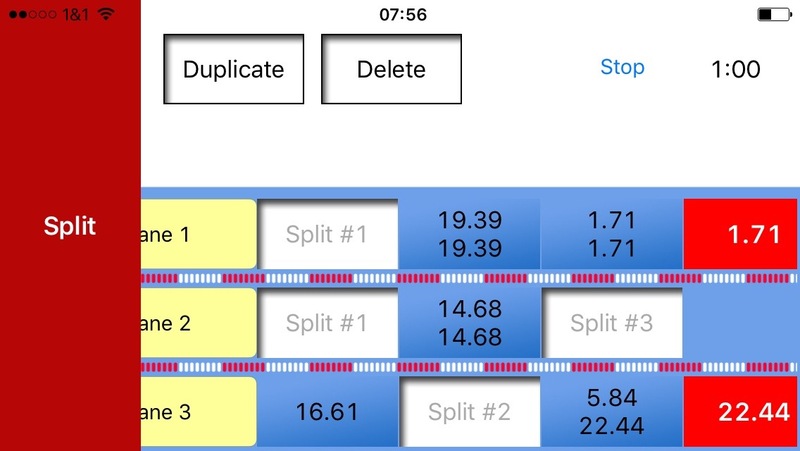 Multi Multiple, largely independent stopwatches in one app, to time several entities or processes at once. Usually just that, a scrollable set of units that function exactly like a Basic stopwatch. The standard application for cooking and the likes falls under timers, though. Sports This is clearly meant as a sports utility, potentially for a specific kind of sports (added in brackets, if it’s very clearly restricted to that kind). Subcategory Sports Multi now folded into this category, as the multi is what sports timing usually is about. Otherwise, a basic stopwatch does just fine. Notice that most multi stopwatches really don’t work for any but the most simple sports timing applications — and thus are sorted into just the Multi category even when claiming to be about sports. If the app fits into more than one category, we put it into the most related one. So, here we go. If you find errors, have questions, would like to see information added or have other comments of any kind, please let Marco (at smartstopwatch.com) know. Work in progress. Come back for more. The U.S. (at least) app store number one rated stopwatch is the most simple version of its kind: It provides just start-stop functionality with no split times. The only minor sales argument: The time is shown in big letters no matter how you hold your phone. Buttons don’t even fully utilize the available screen space, limiting the use for even the most simple sports scenarios. An ad that can be removed for US-$0.99 somewhat restricts the available screen space. Application areas: Most likely in classrooms and such. Otherwise, please, save your money (and download time). The rank comes from excessive reviews which are mostly meaningless. There are better apps no matter your application scenario. The minimal, minimal stopwatch and best option, if you don’t mind the missing ‘:’ between time fractions and slightly thin font that may be unnecessarily hard to read from afar. Just start and stop with a tap almost anywhere on the screen. Just don’t hit the small reset button at the bottom. A basic sports stopwatch with physical (volume) buttons extending the otherwise standard, yet large start/stop and lap/split in-app buttons. Shows lap and split times for a single timing session. The only other specialties claimed: An undo function for accidental stop activations and a simple sharing of time data. With a no-frills, clean user interface, there is nothing really specific for track coaches or running in this sports stopwatch app. But then, that’s not a negative. What’s with that name?? Gimmicky stopwatch and timer app with a rather static feel for people that like somewhat well-done visual clutter and don’t mind to pay for it with needlessly small buttons and text. Lets you share timing sessions by email, yet with only either split or lap times. In alternative timer mode: Just a fixed set of timers. Another app not meant for sports. What makes the app stand out and the number one complaint in reviews: More ads than usual with some UI clutter that interrupts your flow. Or in other words, a great tool to learn how to squeeze as many ads into one app as possible. Could be a + with less ads. The pretty stopwatch that resembles a mid-twenties century handheld stopwatch literally and functionally. The smallish start/stop and lap/split buttons animate the watch. Pretty basic otherwise with multiple lap/split times and sharing to clipboard, Facebook, Twitter and email, no more, no less. If you are pretty, you like shiny, and you want all your things (apps) to be like you, go for it. For the rest of us it’s a pretty lot of utility sacrificed for the beauty. Why this is the best stopwatch and how it relates to fitness in particular eludes us. Fitness probably just sells better. Caveats: The stop button doesn’t generate a final (split) time like you would expect from a normal stopwatch. On the other hand, that can be a benefit as pushing yet another tiny button just for the final time makes using this utility even less practical. The $2.99 just remove the not so pretty ad that otherwise destroys the beauty effect of the watch. No-frills sports timer app in a decent design. Number 3 stopwatch app in the U.S. Apple app store. Also keeps track of you past workouts in a calendar. Number 2 on the U.S. Apple app store, this outdated combination of minimal, seconds-precision-only stopwatch, cumbersome timers and weird switching between the two modes makes you wonder what the heck app rankings are for. Added “bonus”: Stops whatever music you are listening to right now on the likes of Spotify. There is a reason why you need to call your app ‘Best Stopwatch’, we guess. This three-mode timer(?)-stopwatch(?) on “pages” is weird: In stopwatch and lap mode it provides a total time since start and any number of pseudo lap times that either run in parallel to be stopped separately (stopwatch mode) or one after the other (lap mode). To record a lap, you swipe down, which disqualifies the app as a sports stopwatch — way too inaccurate (let alone the weird overlapping lap times that don’t happen in sports). In third mode, countdown, the swiping creates new countdown timer that you have to awkwardly set — hours, minutes, seconds completely separately — and start individually. Like before, they then run in an up-down scroll area. There is no identifier of different counters or lap times other than different, fixed colors. Overall a cumbersome to use aggregation of timer and stopwatch functionality with seemingly no clear positioning. Go figure (and then, please, explain to us). There is an Apple Watch app, though, and we almost suspect that the whole page-swipe concept may work much better there. Feel free to report back and we’ll update this review. Until then, the app doesn’t get our recommendation. Claiming to be “especially for coaches, trainers”, this is yet another (multi) egg timer. Why? Because it replicates multiple basic stopwatches in rather restricted packages: The separate, smallish start/stop and lap/reset buttons just don’t lend themselves to accurate, fast-paced, real-life athlete timing. And there’s no lap times or reset-all either. The people management seems like an afterthought to upgrade lacking concepts with added side features. So, if you must, use this stopwatch app for cooking and such or sports timing where it doesn’t really matter (like a long-running marathon where athletes trickle in and there’s live-timing anyways). For sure this is the stopwatch that ultimate(ly) doesn’t come with either the most pretty-looking or practical of interfaces. As the name already says. Don’t say we didn’t tell you so. Same, same. Just more expensive. The Ultimate Stopwatch in a slightly more modern-looking package with all the same limitations of a pseudo-multi stopwatch. Given the price, please go along, nothing worth to see here. Number 7 stopwatch on the U.S. app store, this multi stopwatch used to run too slow by a lot. As the description says: “Made by a runner for runners”… that don’t mind getting a better-than-life time. Doping for your stopwatch, healthier for you at least. This number-one selling point has been eliminated now apparently. Does provide simple start-stop-reset timing for a fixed number of entities, with start-all, stop-all and reset-all on top. Last updated May 18, 2014. Outdated, basic, (fixed to) four-in-one stopwatch. An actual multi stopwatch for the swim sports with more on offer than the standard multi stopwatch, yet some significant other limitations. For a pre-set number of lanes with presumably just a single swimmer on each lane like in a competitive situation, the conceptually new timing mechanism actually does allow to time multiple athletes, even when these approach split points in close time proximity. The single large timing button, when pressed, records just the split time. In a second step, this time then needs to be moved to a certain position on the scrolling, on-screen virtual lane. There’s still just one common start for all swimmer. Three lanes on iPhone, six on iPad. Even though limit to a very specific scenario, the app sounds useable. In actuality, however, the app leaves much to be desired. You have to move the lanes sidewards manually to find the right spot to attach a split time to and (!) the watch lets you put any time into any split point. Meaning, if you happen to put the first split into Lane 3’s last split time spot, the watch is fine with this and will happily ignore any other split times attached to earlier spots. Probably usable for the occasionally timekeeping grandparent, yet too cumbersome to use for fast-paced workout situations with less systematic timing setups. Nice try, limited applications. Last updated September 11, 2014 (and it shows). This post was last updated on May 16, 2016.